Sale of the Century Video Slot Review - Casino Answers! Sale of the Century is a 5-reel, 25-line video slot found at Random Logic casinos, featuring a wild symbol, scatter wins, multipliers, a free spins feature and three bonus games. You can play the Sale of the Century video slot at Bovada. Bets on the Sale of the Century slot machine are $0.05, $0.10, $0.25, $0.50, $1, $2, $5 and $10 per line. You can select up to 25 paylines per spin on the Sale of the Century video slot. You can bet anywhere from a nickel per spin up to the maximum total bet of $250 per spin. Sale of the Century has a very good betting range that is suitable for most online slots players. You can play the Sale of the Century video slot by selecting your bet and pressing the “Spin” button or using the “Max Lines” button to play all 25 paylines on the Sale of the Century slot game. The top paying symbol on the Sale of the Century online slot is the Sports Car symbol. If you land 5 Sports Car symbols on a selected payline, you will win the 5000 coin top jackpot. The Cruise Ship symbol is another high paying symbol at up to 1000 coins. The Player symbol is the wild symbol on the Sale of the Century video slot. It only appears on reels 2, 3 and 4. It will substitute for all symbols except for the Question Mark and Scattered Logo symbols. 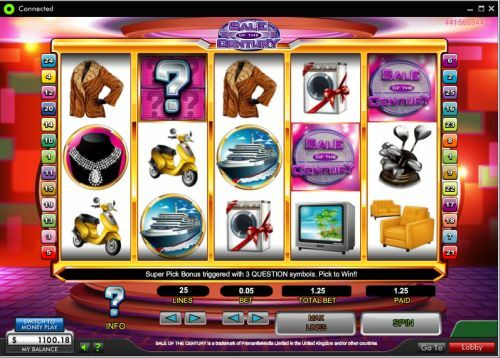 The Instant Win feature can be won at any time during the regular slot game. You will be offered a prize that you can accept or decline. If you decline, you will get up to two more prize offers. You must accept the third prize that is offered. The Instant Win feature cannot be won during the free spins feature. There is a Super Pick Feature is triggered when hte Question Mark symbol appears on reels 2, 3 and 4 at the same time. All positions on the middle three reels will change to show 9 Question Marks. You will choose one Question Mark symbol to win a cash prize, free spins, cash prize AND free spins or the Gift Shop bonus game. If you choose the free spins feature, you will win a number of free spins at a 3X multiplier. All prizes during the free spins feature are tripled. Free spins cannot be re-triggered. Free spins cannot trigger the Gift Shop bonus game. Free spins are played at the lines and bet of the trigger game. Free spins feature wins are added to payline and scatter wins. You can win free cash from this feature when you play at Bovada. Payouts are made according to the Paytable. Payline wins are multiplied by the bet per payline. Scatter wins are multiplied by the totla bet. Scatter wins are added to payline wins. Highest win only on each selected payline. Coinciding wins on different paylines are added. All wins occur on selected paylines except for scatters. All symbols pay left to right, except for the Scattered Logo (which pays any). Player wild symbol appears on reels 2, 3 and 4 only and substitutes for all symbols except for the Question Mark and Scattered Logo symbols. Sale of the Century offers some good bonus features, including the Gift Shop bonus game, free spins feature, Instant Win feature and more. You can play the Sale of the Century video slot when you sign up and make a first deposit for real money at Bovada. Can USA players play the Sale of the Century online slot? No, American players are unable to play the Sale of the Century video slot for real money. Instead, you can play some USA-friendly video slots at Bovada. Is there an autoplay mode on the Sale of the Century video slot? Unfortunately, an autoplay feature is not available on the Sale of the Century slot game. Where can I play a free flash game of the Sale of the Century slot machine? Yes, you can play a flash version of the Sale of the Century video slot at 888 Casino. You can play for free or real money. 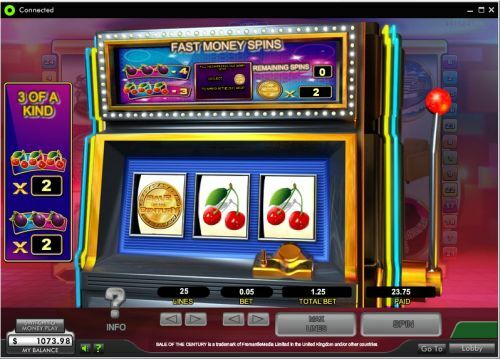 If you have any difficulties with the flash casino game, you can download the newest version of Adobe Flash Player.